SimCity 2013: What the urban planning game tells us about future cities. Lessons in data overload, short-term thinking, and resilience. During Herman Cain’s brief moment as the leader of the Republican primary pack in late 2011, his iconic “999” tax plan got its fair share of criticism from pundits and analysts. But nothing was as damaging as the fact that it looked suspiciously close to the tax code in another land: SimCity. Cain denied taking any ideas from the SimCity franchise, and the episode became just another punch line in a bizarre campaign. But maybe we should have taken advantage of that moment to ask whether the urban planning simulator could actually give lessons that might help us out in real life. Past SimCity games inspired many a dilettante’s interest in urban policy. Now the first new SimCity title in a decade, available for PCs in North America on Tuesday, can do even more to teach us about urbanism in the 21st century. The four major SimCity titles, released between 1989 and 2003, made urban planning something kids could do for fun. The task is to plot out a city, manage its services, grow its population, and—above all—keep the citizens happy. Along the way, the player, as mayor-overlord of the simulation, controls zoning, budgeting, transportation networks, power grids, and more. Whether or not it was meant for presidential politics, the big takeaway was that a balanced budget was the key to success, and megapolitan sprawl was the reward. The decade since SimCity 4’s release has seen a major urban renaissance. For the first time in history, most of the world’s population lives in cities. Big cities are safer than they’ve been in generations, and cookie-cutter suburbs are falling swiftly out of fashion. In their place, the New Urbanism movement has taken hold, spreading the gospel of dense, walkable, tech-savvy, environmentally friendly cities. These values have become paramount for cities around the world, and guiding principles for cities built from scratch. It’s only right that the new SimCity, which Slate’s Farhad Manjoo deems “crazily addictive,” embraces these new precepts and builds on them, showing the rewards and challenges of the new urban planning. Chief among them: understanding all the systems at play in urban life, and figuring out how to manage the information they give us. The game’s so good that when FastCoExist brought together a bunch of urban planners to play, thinking that they would work together to create utopia, they ended up becoming insanely competitive. It used to be that ignorance was bliss. Beyond managing commercial, residential, and industrial zones, and their necessary infrastructure, players mostly just knew when things went really right—or very badly. Thanks to new computer modeling, however, SimCities are now functions of citizens, networks, resources, and consequences—making them more applicable to the real world than ever before. In past games, all it took to fix pollution was bulldozing some factories. Now, actions affecting the environment have real, lasting consequences. To tinker with the environment during a preview of SimCity, I created Sneedville, a playground for my more destructive tendencies. 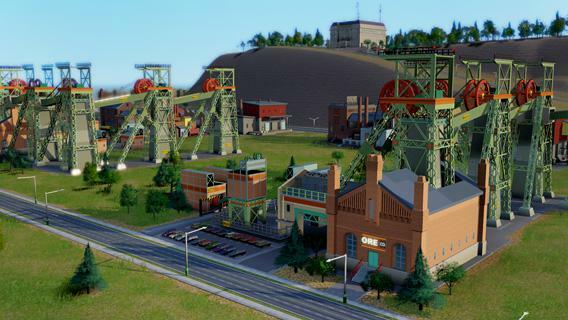 The area in which I founded my city was rich in coal and metal ore, so I chose to specialize in industry. The town began with an industrial site on top of the ore deposits. I constructed neighborhoods so factories and mines would have employees, and I built commercial zones where citizens could shop. As the simulation played out, the industrial zone thrived, and the mines brought in money from other cities in the region. Because of the work available to them, the residents of Sneedville were low-income. This limited the city’s tax revenue, and there was little incentive for people to move into town. Worse, data showed that pollution from the industrial park was lowering property values and diminishing quality of life. It also turned out that the ore beneath the mines was being depleted. The city was off to a decent start financially, but following the trend lines wasn’t hard. Real estate was limited, so I needed to make a decision. Should I dedicate myself to industry, knowing it will bring money as well as environmental damage, and that the area’s lifeblood would someday run out? Or should I try diversifying the economy by shifting to, say, commerce, education, or tourism? The second approach would take time, money, and land away from the city’s greatest source of income, and there was no guaranteed success. My ill-fated city faced two challenges that are all too familiar for real urban areas. First is the difficulty of changing course. The decisions I made early on made sense and brought rewards. But as I focused on maximizing them, other elements suffered. Even though it was a simulation, the degree of ownership I felt over this town led to a real sense of conflict when faced with the risks of correcting course. It’s a situation all too familiar in the Rust Belt, where cities have long relied on the once lucrative manufacturing industry for jobs and tax revenue. As those dried up, Detroit and Cleveland became notorious for their struggle to move on. Pittsburgh, on the other hand, made notable progress by acknowledging that its days as a steel powerhouse were over, finding new life by investing in research and education. Similarly, the second lesson was one in resilience—a wildly popular buzzword at the moment. As long as the area relied on mining, a shutdown in the supply chain brought everything to a halt. If storage facilities filled up, or transportation shut down, or a fire broke out, people couldn’t work and the city couldn’t make money. Urban resilience had its big moment in the spotlight after Hurricane Sandy. Flooded subways and busted power grids hobbled New York City for days and caused an estimated $18 billion in damage there. The question then was how to limit the damage from increasingly powerful natural disasters, and that’s still a worthy question to ask. But one thing that’s not as obvious to us, that SimCity demonstrates expertly, is how even small events can have cascading consequences. The real problem for the game’s designers: figuring out how to turn massive amounts of data into meaningful information. “We knew from previous SimCitys that there’s this data overload that can happen that turns off a lot of players,” said Stone Librande, SimCity’s lead designer. “[That] game isn’t approachable because it feels like you’re playing a spreadsheet.” That’s a fact that real cities need to realize as they embrace technology and data to help inform their citizens. They can collect and release all kinds of data, but it’s essentially meaningless if it’s not presented in a useful way. SimCity’s creative director Ocean Quigley, who lives in Oakland, Calif., looked to his own city’s crime map as a starting point, and built on the idea from there. The result is something like an ideal version of Rio de Janeiro’s high-tech command center, which collects data in order to identify trends in the city. IBM’s chief technology officer, told the New York Times that the command center runs on “sense-making software,” and that’s the best description of how SimCity treats data. One map might show a high death rate in a corner of a city. Glancing at a map for crime or illness can shed light on the fact that emergency vehicles can’t get there in time, or pollution is out of control, or those enthralling sewage pipes have backed up and spread disease. Once you know the problem, you can get started on a solution. After understanding the real-time, on-demand stats in SimCity, you’ll want to know what your city—the one you live in—has to offer. With a few small exceptions, you’ll probably find out how much you don’t know about your area, and how much it doesn’t know about itself. Cities around the world are latching on to the open data movement to fix this. Palo Alto, Calif., recently launched an online dashboard for public data, and groups like Code for America pair local governments with programmers and designers to help open up data to the people. However, turning data into usable forms is still difficult for cash-strapped cities, and even opening up that data to the public can become mired in politics. Growing up in a household that loved SimCity, my family had a common refrain that anyone holding public office should be able to pass the SimCity Test. The newest game, putting players face-to-face with climate change, resilient systems, and open data, makes that more true now than ever before.